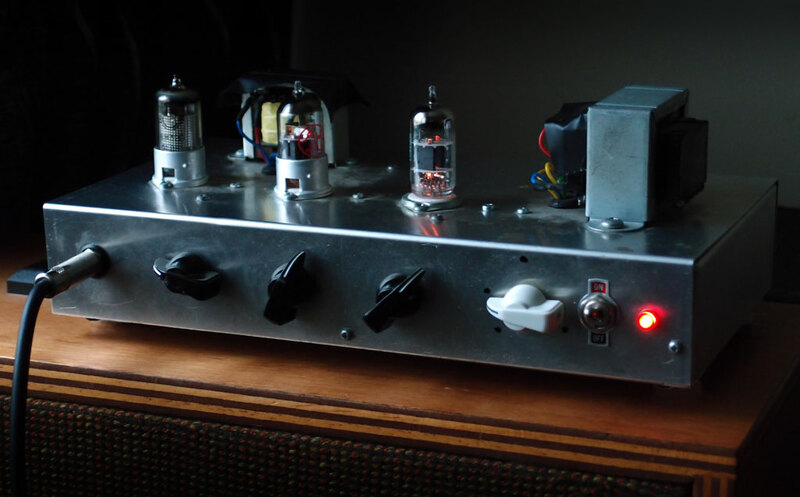 While it might seem crazy to add a variable HT/B+ to a One Watt amp, that is exactly what I have done and I am very pleased with the results. 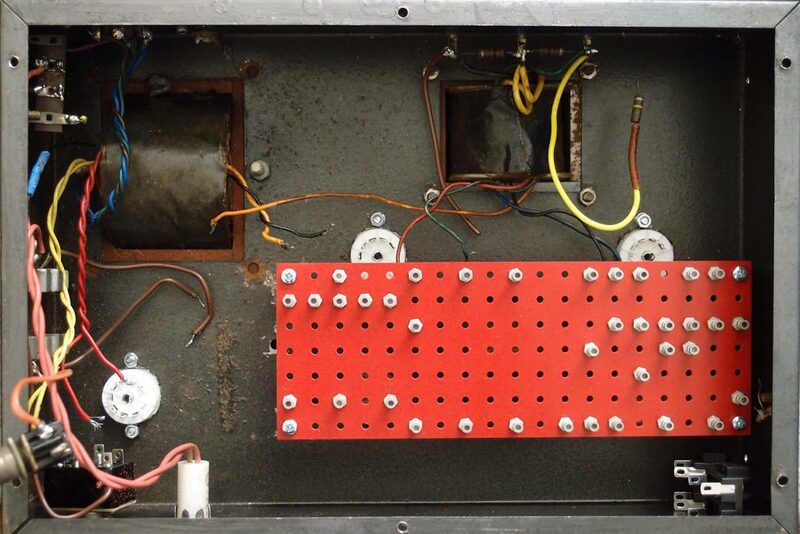 You may recall from an earlier post that I found that even a “puny” 1W amp was too loud in some circumstances; this post describes the solution that I chose. 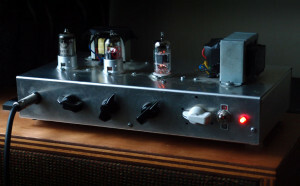 Denis Cornell takes his Romany Plus amp down to 50mW and, while I was skeptical that 50mW would be a useful amount of power, it had to be worth a try. In fact I decided to go for 100mW as it should sound half as loud as 1W. The white, chicken-head knob that you can see in the picture allows the power output to be scaled from 10% to 100%. The black dots around the knob indicate the positions of eighth-, quarter-, half- and full-power. Click here to view the schematic (the new section is around the Power MOSFET Q1). I only completed the work on it today but I am really impressed. At the lower power settings there is no clean headroom but that’s the point. You reduce the HT/B+ to get distortion at ultra-low volumes; If you want clean you can increase the HT/B+ and reduce the gain. The tone of the amp doesn’t really seem to change as you change the power output although down at 100mW it loses a little sparkle; I prefer 0.25W. 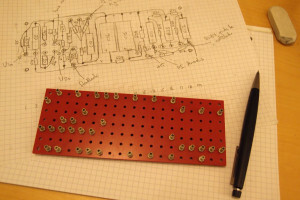 I won’t go into the details now but I will be updating the Little One website soon and you can read the final section of Merlin Blencowe’s book on Power Supplies if you need any information about the MOSFET voltage follower. Little One was only ever intended as a prototype but I’ve been using it for years. It looks tatty and the circuit has grown organically to the point it will be tricky to change as you can see from the picture. It’s about time I rebuilt it. Update: Having played the modified amp for a couple of weeks now, I think Denis Cornell got it 100% right (hardly a shock). 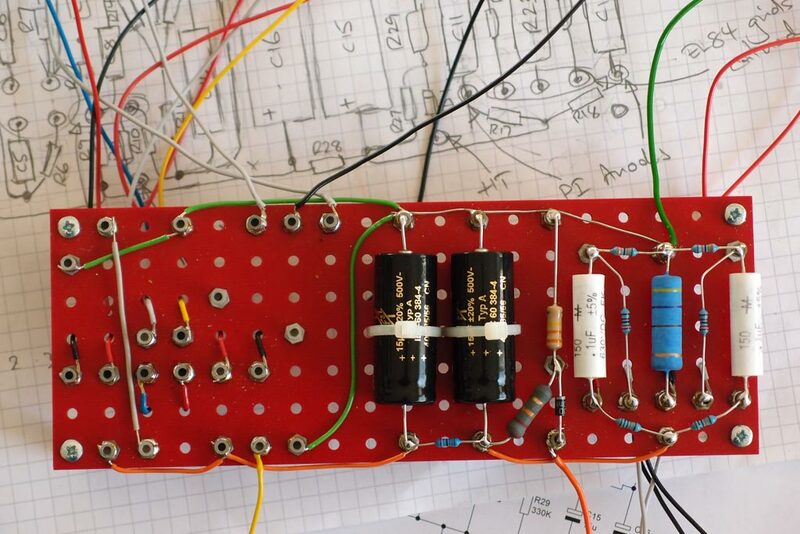 If you’ve got an efficient speaker, you should be able to run your amp at 50mW. This will allow you to get some bite and crunch at the same volume as an acoustic guitar. To do this change R24 to 130K (120K will do). Click on the image to see a larger version of the layout. 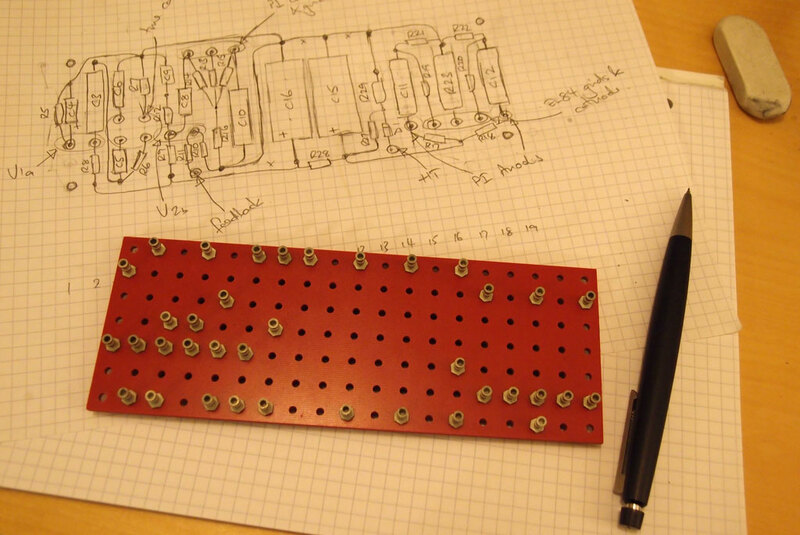 The associated schematic can be found here. Note that the layout does not include C7, C13, C14, C18, R24, R25, R26 or R30 as these will be mounted elsewhere in the chassis. I was out playing music at a friend’s house and took Little One along to show it to the other guitarists that were there. They loved it, which was reassuring (it sounds great with a boost pedal in front of it), but what sticks in my mind most is that it wasn’t drowned out by the drummer. Okay, we were playing in a kitchen and the drummer wasn’t hitting the skins as hard as he could but the fact remains; one watt is louder than you might think. In fact, one Watt is half as loud as 10 Watts which is half as loud as 100 Watts so one Watt is pretty damn loud. It’s easy to miss that something is unacceptably loud when you’re playing on your own; your ears quickly become accustomed to the volume but the neighbours don’t! Guitar amps designed specifically for home use should be as quiet as possible without sacrificing tone. How quiet can the turned-up-to-eleven tone be? That’s what I’ve got to find out. Attenuate the signal after the output transformer making sure that the amp always sees the required load. The Vox AC4 has an in-built resister network to drop the output from 5W to 1W to 0.25W. Using resistors will change the tone of the out put stage so is not the best appoach but there is a hint that 0.25W is a useful amount of power. 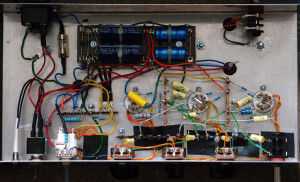 Denis Cornell’s Romany amp goes one step further by delivering 0.05W (50mW). Drop the HT (B+) Voltage using a Zener Diode which will reduce the power of the amp as a whole. 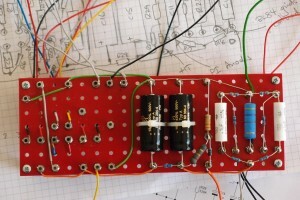 To half the power output would require a drop of 75V which is quite a lot but achievable because it’s a low-powered amp. Drop the HT (B+) Voltage using a VVR circuit which will allow increased flexibility which may be required given what Vox, Cornell and others are doing. Progress has been slow up to this point but all the effort that was put into the design is starting to pay off and the amp is coming together quickly. I have made one minor change to the plan: I was going to put the flying-leads onto the valve sockets to keep the turret-board tidy until it was put into the chassis but I realised that would be rather impractical so the flying leads are now soldered onto the turrets as you can see. It makes the board a little more difficult to work with but it would be very difficult to solder flying-leads onto turrets in the chassis. Much easier this way and I discovered a little dodge to keep the flying-leads out of the way. I have a ValvePower guitar combo that uses perforated turret board so I had a close look at that and noticed that the flying-leads were pushed through the holes to keep them out of the way of the rest of the circuit. A neat idea that I adopted immediately – you can see the effect in the picture. I haven’t designed this into the circuit but I need a way to cut the low bass. This requirement has come up a few times in conversations with bass players and it makes sense. In a domestic environment rooms are small and the wavelengths of bass notes are relatively large. At home bass-player will have to reduce the amplitude of low bass to avoid problems. By how much is the big question; more research is required. Christmas has come and gone and I’ve finally had the chance to finalize the layout for the Northcourt turret-board. It’s pretty small because it has to be to fit in the case so the components are pretty tightly packed in. 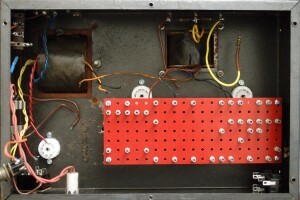 Some of the components will be mounted off-board to save a little space: C7, C18 and R30 will be mounted on the tone controls and R24 and R25 will be mounted on the valve sockets. You’ll have noticed that the turret-board has lots of holes in it. This allows the turrets – which are screw-mounted – to be easily re-positioned. A useful approach when you’re as fond of making mistakes as I am. The turrets and board came from www.ampmaker.com. The turrets aren’t cheap but the approach does simplify things. The next step is to wire up the chassis with flying-leads to attach to the turret-board. Hopefully, I will get the time to do this soon.